The world became increasingly compartmentalized throughout and after the industrial revolution, not only on the assembly line but also in our culture. In the art world as well, the line between “high” and “low” art became wider and more pronounced. “Wanted: Selected Works from the Mugrabi Collection” currently on view at the Tel Aviv Museum of Art, showcases a spectacular group of works by Andy Warhol, Jean-Michel Basquiat, Richard Prince, Tom Wesselmann and Adam McEwen (unfortunately, this boys club reflects the historical reality of the Pop Art movement), whose works react against this paradigm shift to blur, stretch and question what is worthy of the status of fine art. So what is the difference between fine art and design, graffiti and advertisements? Marcel Duchamp took a urinal, turned it sideways and called it art. The porcelain throne’s cultural worth lies in the ideas and genius of Duchamp. He was one of the first artists to question the holiness bestowed upon museums and force art lovers to look at a urinal for its aesthetic and philosophical potential. In a delightful irony that Duchamp would have reveled in, a version of that piece was sold to Mugrabi in 2002 for $1 million dollars (not featured in this exhibit). In our world, objects are not evaluated purely on the worth of their raw materials or practical function, and from a certain perspective the trompe-l’œil that Renaissance painters used to make mud on cloth mimic our world, is as fine a trick as Duchamp’s urinal. The five artists on display are the intellectual offspring of Duchamp, as is most obvious in the work, “Untitled (Plunger)” by Adam McEwen. 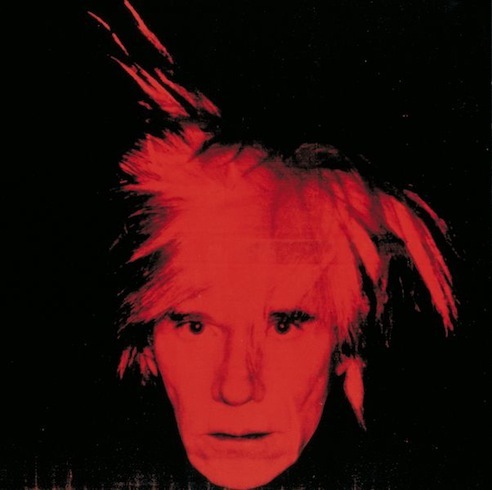 The graphic designer turned celebrity artist, Andy Warhol is the obvious star of the exhibit, as well as the obsession of Jose Mugrabi who has the largest collection of works by Warhol in the world. Many of the best paintings by Warhol are exhibited, including a self-portrait, some Marilyns, Jackies and an Elvis. Warhol was obsessed with commercialization and celebrity, which through careful advertising can make a normal person or product worth far more than market value would normally dictate. Even his carefully constructed persona was part of this emphasis. In one spectacularly large piece, Warhol copied the face of Jesus from Leonardo Da Vinci’s last supper and repeated it 112 times in yellow on black, which any graphic designer could tell you is one of the most attention grabbing color combinations. People learn to love and respect things through increased exposure to them. Thus this mechanical repetition of Jesus’ face is an interesting commentary both on the fine art and on Christianity. Basquiat, the first graffiti artist to break into the art world, was also obsessed with celebrity, both his own and others. 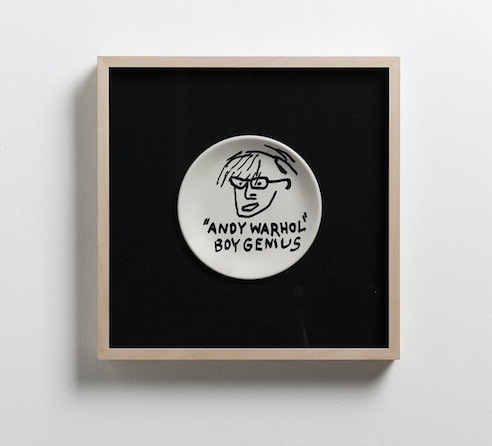 Along with his many paintings hanging in the exhibit, is a group of plates on which he painted the names and cheeky illustrations of famous artists and personalities that he admired. This is the first time the work has ever been exhibited in a public institution and as the catalogue highlights, “in the graffiti world, artists customarily surround large works with the names of their friends and other sources of influence in a gesture of homage.” The plates were bought at thrift stores and some still have their prices on them, which no longer reflect the worth of the plates as their cultural value has increased exponentially due to Basquiat’s genius and celebrity. Collector’s themselves often obtain a persona of celebrity and commercialism and Mugrabi is no exception. Warhols are hardly ever sold without consulting Mugrabi and he notoriously shows up to auctions in jeans and a baseball cap. These affluent men and women are sometimes referred to as garish and showy, but the art world and museums could not exist without them. It is exactly their generosity and celebrity that makes the intellectual conversations possible and infuses works of art with their cultural worth. This is particularly appropriate and interesting in the case of Pop Art. Duchamp would have been proud.